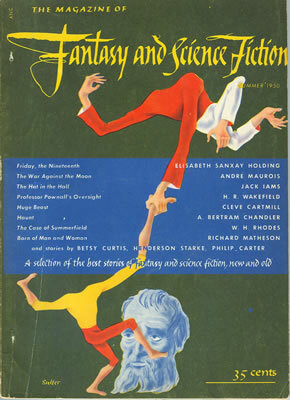 While your editors agree firmly with August Derleth that Science Fiction is simply a branch of fantasy - that is, of the imaginative literature of the impossible made convincing - there are readers and critics who insist that a sharp line must be drawn between the forms. A. Bertram Chandler, one of the foremost writers of science fiction in contemporary England, has posed those purist a beautiful problem in Haunt. Here is a story which combines belief in space travel with belief in the supernatural, which quotes J.W. Dunne on time theory while creating a medium who might have stepped out of BLITHE SPIRIT. Here, above all, is one of the unclassifiable items that gladden an editor's heart - a story with a new concept, so plausibly told that you may find for many days after reading it that it is you who are haunted.